Successfully Added 1200 Lumen LCD Projector - 800x480 Resolution, 16:9 Ration, 4 Inch LCD TFT Display, 50,000 Hours to your Shopping Cart. Create powerful business presentations, enjoy relaxing movie nights at home or show off your vacation photos in style with the Mini LCD Projector, sporting 1200 Lumens, 800x480 resolution and a 50,000 hours lifespan. An LCD projector is a great tool to have around. It’s useful for business, entertainment, educational projects and more. It gets even better when the projector is portable — which is exactly the case with this mini LCD projector. Super lightweight and easily portable, it can help you out at the office or at home — you can even bring it along on a trip, as it comfortably fits into the smallest bag or even pocket. The mini LCD projector comes with 1200 Lumens and will have your media displayed in bright colors, with lots of light. Your media will be displayed on a nice 30-120 inch projected screen with 800x480 resolution. Despite its miniature size, the projector is ready to serve you long and well — its LED lamps come with the lifespan of 50,000 hours. The projector also features a nice 4 inch TFT LCD display for easy operation. A number of projection modes, including throwing, back projection, desktop and ceiling offer great flexibility and let you have the projector anywhere in the room. Thanks to its small size, the mini projector won’t take up space in your home or office and can easily sot on your computer desk. It’s a great tool for kids’ creative projects, class presentations and more. 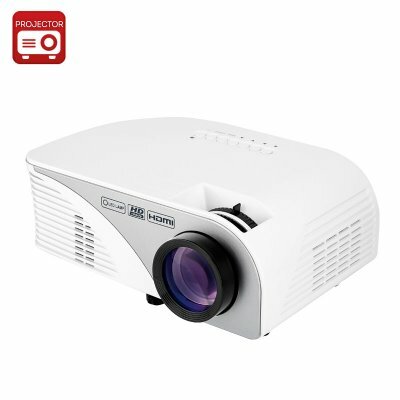 The Mini LCD Projector comes with a 12 months warranty, brought to you by the leader in electronic devices as well as wholesale mini LCD projectors..